BANK bosses have backed plans to groom local talent for leadership positions and specialist roles in the finance industry, while recruitment companies flagged areas where expertise is lacking. Industry leaders said they are 'heartened' by Deputy Prime Minister Tharman Shanmugaratnam's call this week to build a strong pipeline of local finance leaders that will boost Singapore as a financial centre. Mr Tharman announced plans to roll out more scholarships for young professionals and offer help with international postings. The Monetary Authority of Singapore will also work with financial institutions to co-fund courses to groom young Singaporeans for leadership roles. A Straits Times check found most local and foreign banks here are staffed largely by Singaporeans and permanent residents. 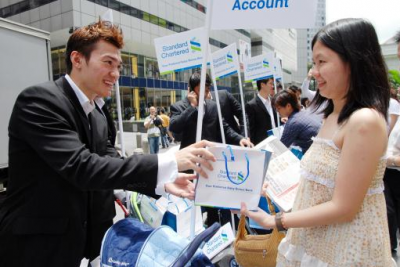 About 75 per cent of Standard Chartered's 7,000-strong workforce is made up of locals and PRs. UBS Singapore's proportion is close to 80 per cent, while the figure stands at more than 90 per cent for DBS Bank and Maybank. Ms Samantha Chia, head of human resources at DBS, said the bank believes in grooming talent in the markets it operates in and tapping their local connections and knowledge. That is the same approach taken by Stanchart Singapore chief executive Ray Ferguson, who noted that it is the bank's 'responsibility to groom a sustainable pipeline of local talent'. He is keen to work more closely with the Government on a formalised mentorship programme. Stanchart also recruits actively from local universities, hiring an average of 60 graduates a year, mostly Singaporeans. Mr Edmund Koh, chief executive of UBS, said growing and grooming the pipeline of local talent has always been an important priority for the bank. It launched the UBS Business University Asia-Pacific here in 2007 to provide training for staff who are new to the wealth management and financial industry, and ongoing training and professional development for existing staff. But industry players admit that Singapore's talent pool is lacking when it comes to roles in specialised and unique fields such as speciality insurance, quantitative finance and risk management. However, other countries also grapple with finding the right talent for these areas. Mr Jerome Bouin, managing director of recruitment consultancy Michael Page International, said there is also a shortage of local talent at the very senior end of the investment banking and private equity industries. 'Roles requiring specialist finance skills in the oil and gas and metals and mining industries are also difficult to match with existing local talent at this point, but with more Singaporeans building the necessary competency and skill sets, this is set to change. Ms Lam Yimin, a consultant at Robert Walters Singapore's financial services division, said there is a shortage of talent in the more technical areas of quantitative finance and risk management, as these are relatively new areas for Singapore's finance industry. 'In addition, Singapore has historically taken direction from the United States or Europe on emerging developments in these areas before implementing frameworks locally. 'This means it will take time to build up a talent pool of professionals,' she added.